Up to four connections are available, using appropriate adapter cables (2 x CAN, 2 x LIN). 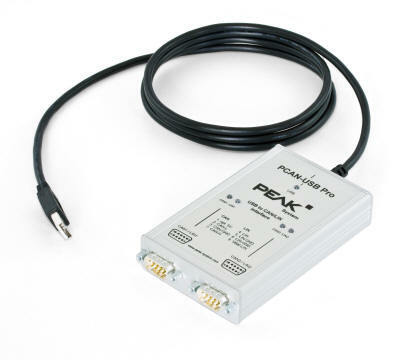 Its robust aluminium casing makes the PCAN-USB Pro adapter suitable for mobile applications. In many applications (in particular automotive) LIN is used as a low cost, low performance, local data collection or control bus. This module acts as a gateway between a CAN bus and a LIN bus. 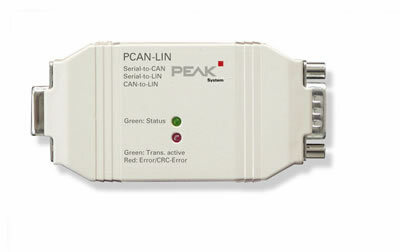 A software package is provided that can set up the PCAN-LIN in one of a number of modes ( CAN to LIN, Serial to CAN, Serial to LIN). The most useful of these is the CAN to LIN mode. Using it the module acts as a LIN master windowing its LIN addresses onto a selected area in the CAN message space and through that window sends incoming CAN packets to LIN and LIN to CAN. A user-definable LIN-ID list provides a simple mechanism for scheduling a limited number of LIN messages to take place cyclically. IPEH-002028 for which the CAN port uses the "slow CAN" and the TJA1054 transceiver. The PLIN-LWL package enables any LIN section to be implemented with an optical link. 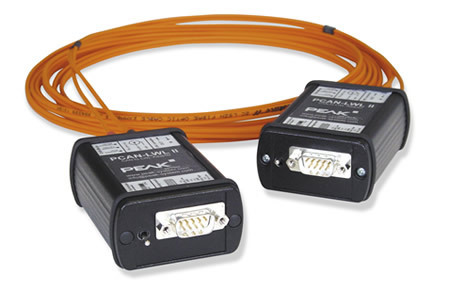 The optical waveguide consists of a 62.5/125 μm duplex fibre optic cable with ST connectors. Bit rates from 2.4 kbit/s up to 20 kbit/s are supported. It has a TJA1028 LIN transceiver and switchable master termination. Areas of application include EMC measurements on LIN modules, LIN sub-sections with high electromagnetic irradiation and lines that pass through areas where there is a risk of explosion. C, VB, Delphi, Pascal and CANVIEW bus diagnostic package. PCAN Explorer A sophisticated CAN bus logging and diagnostic package for use with complex applications including GUI and J1939 support.